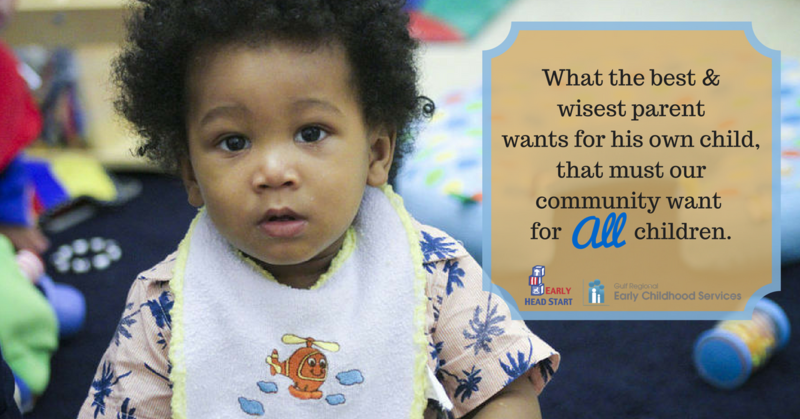 A primary goal of Early Head Start Mobile is to ensure that infants and toddlers receive the type of safe, healthy, emotionally secure and intellectually enriched early start in life that will serve as a solid foundation for future success in school and in life. Our educational practices are firmly based on established child development principles and widely recognized, research-based best practices for infants and toddlers. High quality infant/toddler care is like no other. It is a special kind of care. It requires: highly trained staff who understand infant and toddler development; high quality environments that support children’s healthy growth and skill development; and, close relationships between staff and children and between staff and children’s families. Primary caregiving is the practice of assigning one person to a small group of children and families. The main goal of primary caregiving is to build strong relationships between the family and teacher/caregiver. Primary caregiving provides families and caregivers many opportunities to build relationships with each other. In Early Head Start Mobile classrooms, each child is assigned a primary caregiver/teacher for the duration of their time in the program. This practice supports relationship building and bonding between child and teacher. Being able to tune in and focus on just a few children results in teachers becoming keenly aware of each child’s needs, habits, interests and developing abilities. Research has shown that early learning is greatly enhanced by emotionally secure, long term relationships between infants and toddlers and a few important adults in their lives. Those early relationships are essential to healthy brain development. Early Head Start Mobile supports ongoing relationship building by practicing continuity of care. Continuity of care is when the same teacher stays with the child and family during of their time in Early Head Start. Because low child to adult ratios have been shown to result in better outcomes for children, each caregiver/teacher in Early Head Start Mobile classrooms is assigned to four or fewer children. Additionally, class group sizes never exceed eight children. Teachers in Early Head Start classrooms must meet rigorous educational requirements and maintain a commitment to ongoing professional development. Teaching staff must hold, at minimum, a Child Development Associate Credential with an Infant/Toddler endorsement and must demonstrate the ability to provide infants and toddlers with responsive, nurturing care within a stimulating environment. Teaching staff participate in extensive ongoing professional development activities throughout the year to extend their knowledge and improve their caregiving abilities. No less than 40 hours of training is offered to teaching staff annually. Additionally, each teacher receives classroom-based coaching and technical assistance from specialists monthly. The setting for early care and education is critical in stimulating and supporting children’s skill development and well-being. Early Head Start Mobile’s infant/toddler environments are carefully designed to ensure children’s health and safety, and offer infants and toddlers appropriate and important developmental challenges. The Infant/Toddler Environment Rating Scale – Revised (ITERS-R) is used twice each year to evaluate and assess and the quality of the children’s environments. The Creative Curriculum for Infants, Toddlers, and Twos is used in all Early Head Start Mobile classrooms. This relationship-based educational approach offers teachers a framework and guide for preparing developmentally appropriate environments and for creating daily routines and meaningful experiences that respond to children’s strengths, interests, and needs. A large variety of materials, activities, and opportunities for exploration that support learning at all developmental levels are available daily in order to help children gain the social competence and skills necessary to succeed in school and life. Developmental screening and assessment of infants and toddlers is the key to individualizing the curriculum and to planning appropriate learning experiences that respond to children’s individual interests, learning styles, and abilities. Developmental screening is used to determine whether children are learning basic skills when they should, or if they there might be a need for further evaluation. Early Head Start Mobile utilizes the Ages & Stages Questionnaires®, Third Edition (ASQ-3™) and the Ages & Stages Questionnaires®: Social-Emotional (ASQ:SE) as its screening tools. All infants and toddlers are screened upon program entry or within 45 days of enrollment and then yearly thereafter. Assessment is an ongoing process that occurs throughout a child’s enrollment in Early Head Start Mobile that tracks and records a child’s developmental progress. Ongoing assessment serves to identify a child’s unique strengths and needs. Additionally, it is used to determine what skills and abilities a child has what skills and abilities the child should be acquiring. Early Head Start Mobile uses the Early Learning Accomplishment Profile (E-LAP), a criterion-referenced instrument measuring development in 6 domains, as its ongoing developmental assessment tool. E-LAP is appropriate for all children, including those with disabilities. It is completed for each child three years each year and serves as a guide for individualized educational planning. Research has shown that parent involvement in their children’s early education increases parents’ understanding of appropriate educational practices and improves children’s development, and that it improves children’s educational outcomes, especially in the area of literacy. Early Head Start Mobile teaching staff work in partnership with parents to plan, implement and evaluate the educational experiences provided for children and families. Parents are encouraged to participate in all aspects of the educational program, from volunteering in the classroom to planning parent and family events. Join our Mailing List to receive our monthly e-newsletters delivered straight to your inbox!